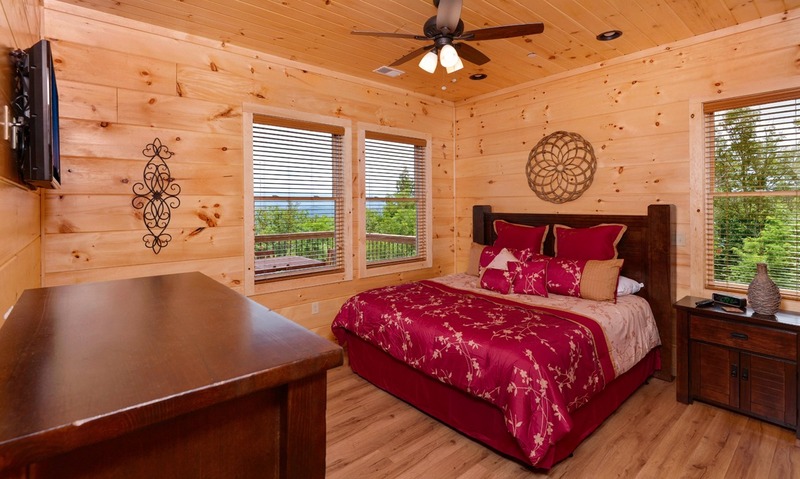 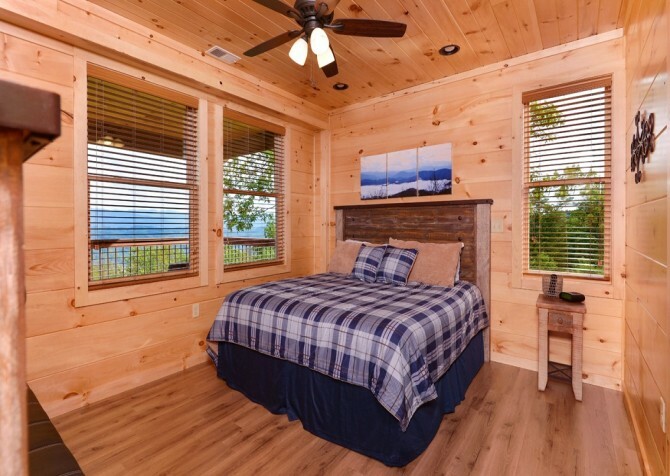 Absolutely gorgeous describes the views and the cabin at Smoky Mountain Manor, a 10-bedroom, 10-bathroom (plus 2 half baths), 6,200-square-foot cabin for 48 in Pigeon Forge. 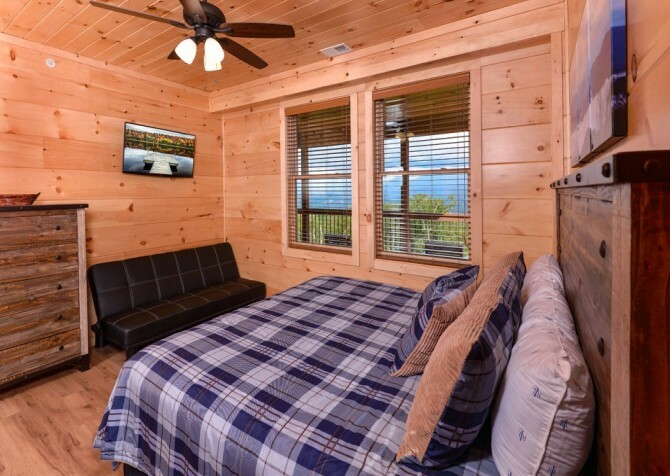 Secluded at the top of a beautiful mountain development, the cabin offers plenty of privacy with no other cabins in sight! 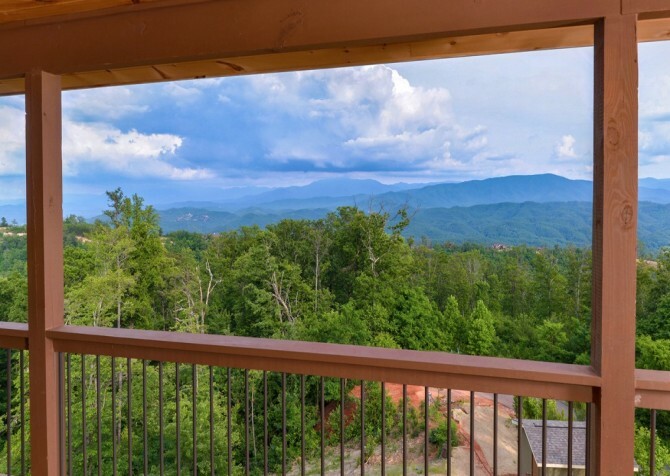 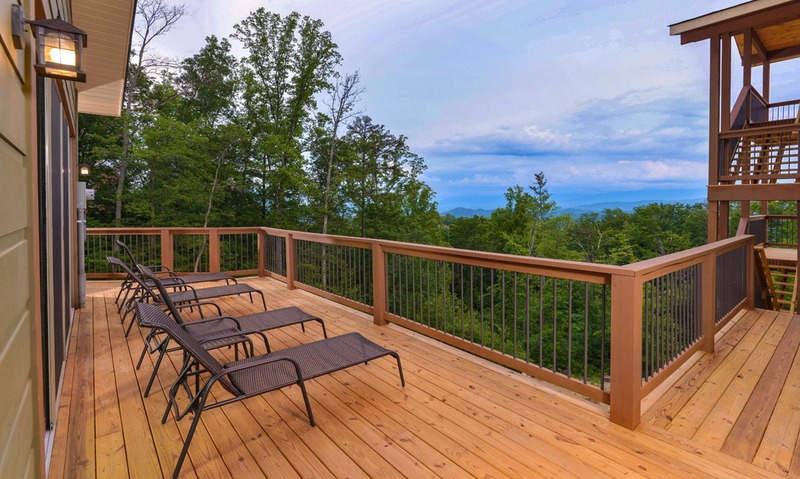 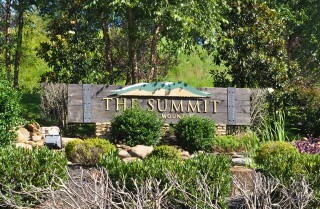 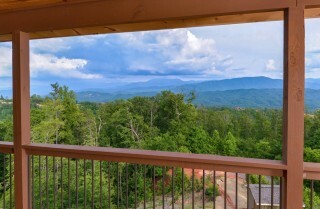 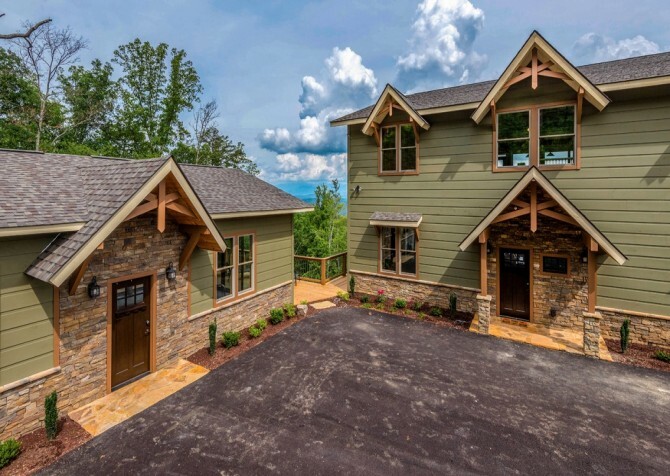 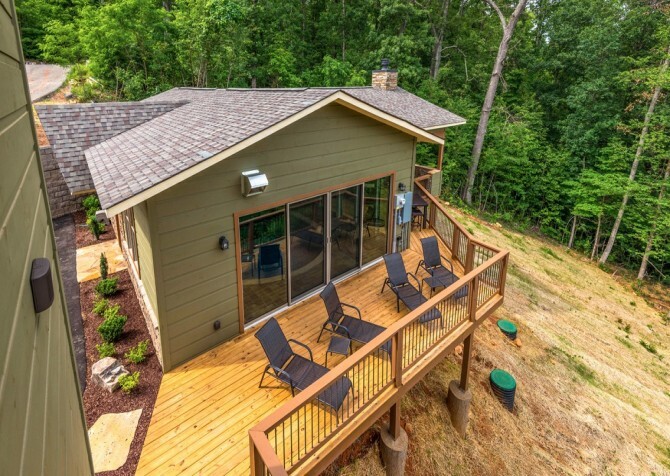 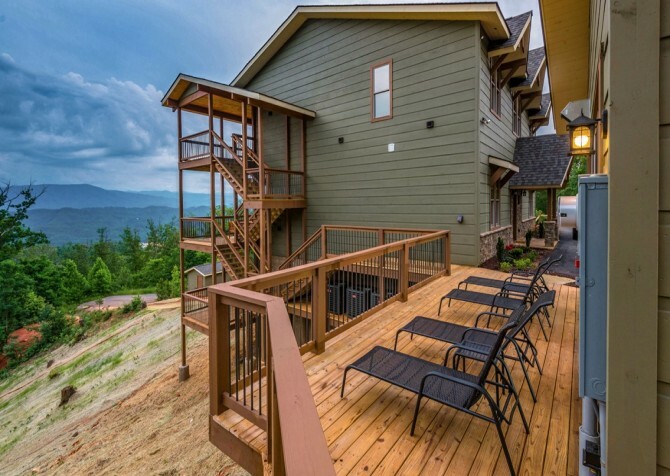 Your neighbors will be the rolling hills of the Smoky Mountains, with views of Mt. LeConte, Clingmans Dome, Mt. 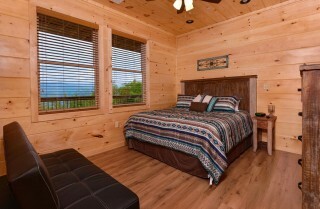 Buckley, Mt. Guyot, and even North Carolina on clear days! This newly built cabin (finished summer 2017) blends top-of-the-line amenities, the conveniences of home, stylish décor, and beautiful finishes inside and out for a stunning getaway that aims to pamper and entertain for reunions, retreats, special occasions, and big family vacations. 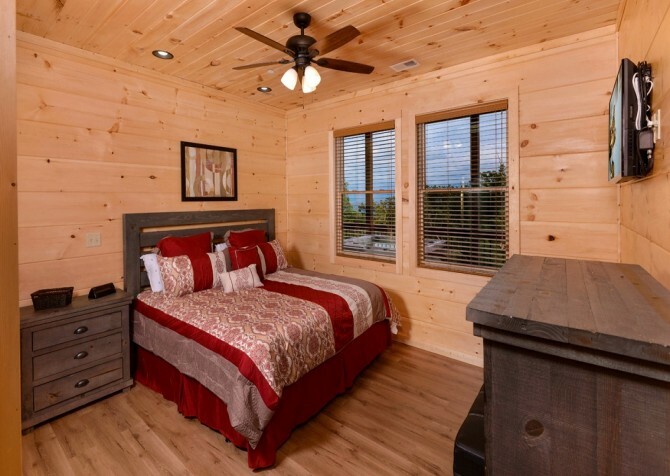 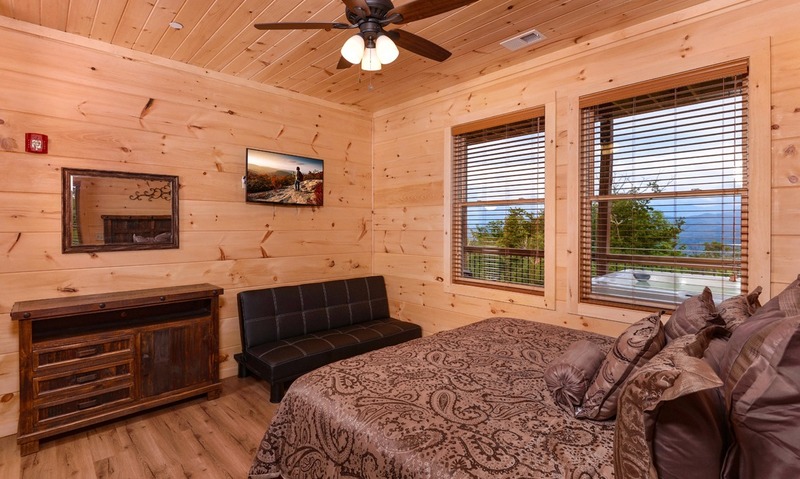 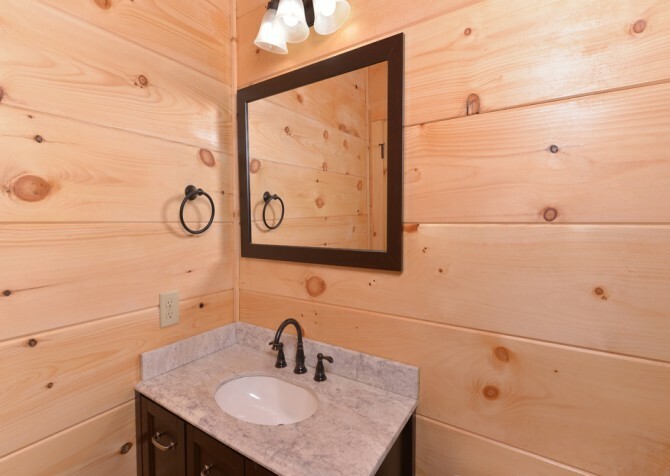 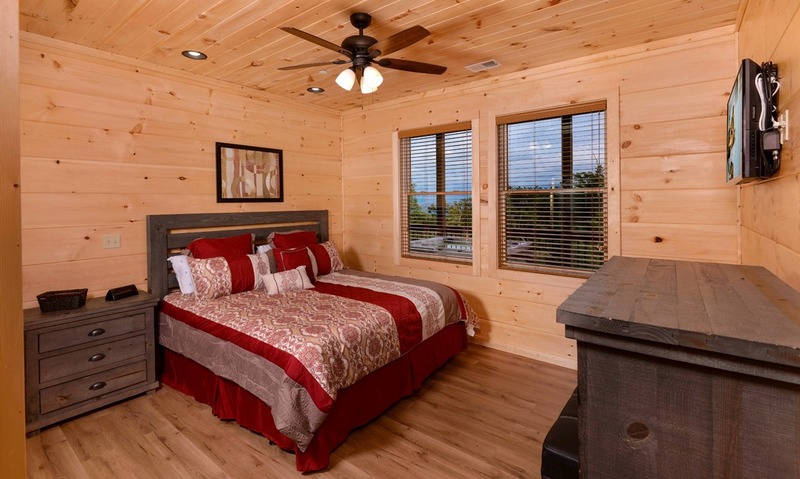 Each space has been designed with great care, offering you a truly memorable home away from home in the Great Smoky Mountains! Start mornings at Smoky Mountain Manor sipping coffee in the deck chairs (overlooking the mountains), soaking up some sun in the lounge chairs on the sundeck, or sitting down for breakfast at the dining tables on the decks. 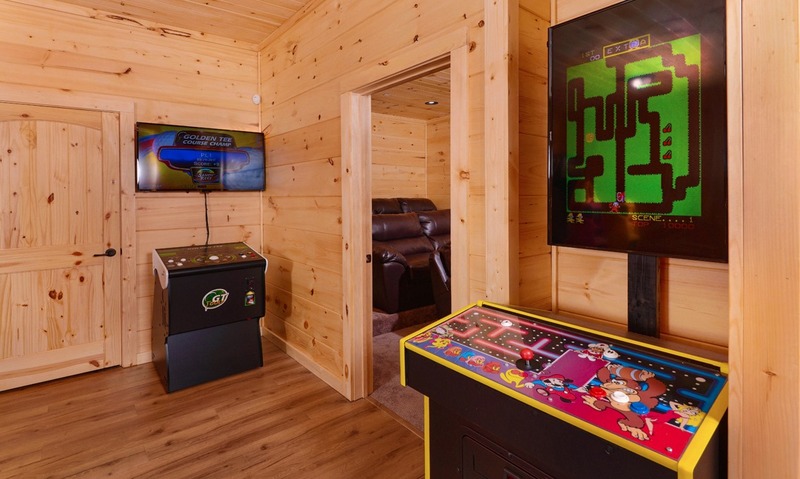 Spend days playing pool, trying Golden Tee Golf, racing against each other on the Cart Fury racing games, getting nostalgic with classic arcade games, and splashing around in the pool house that boasts a dining table, and 27-foot kidney-shaped pool. 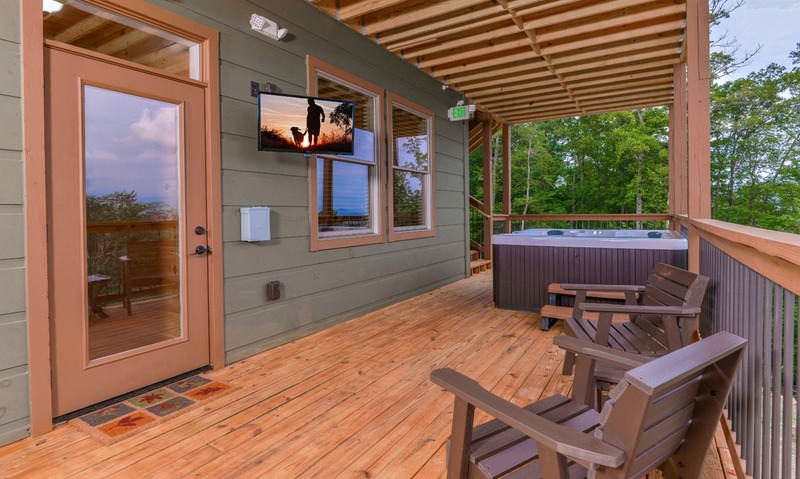 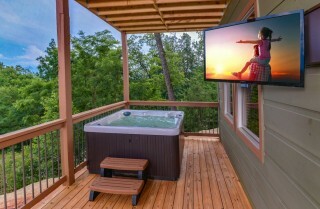 At night, soak in the 2 hot tubs with TVs, climb into a cozy king-size bed, warm up by the outdoor fireplace on the covered deck, have movie night in your theater room, or whip up group meals with double appliances in your large, well-equipped kitchen! 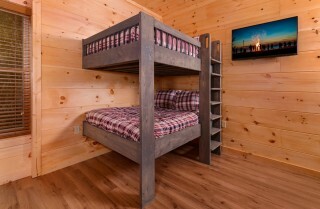 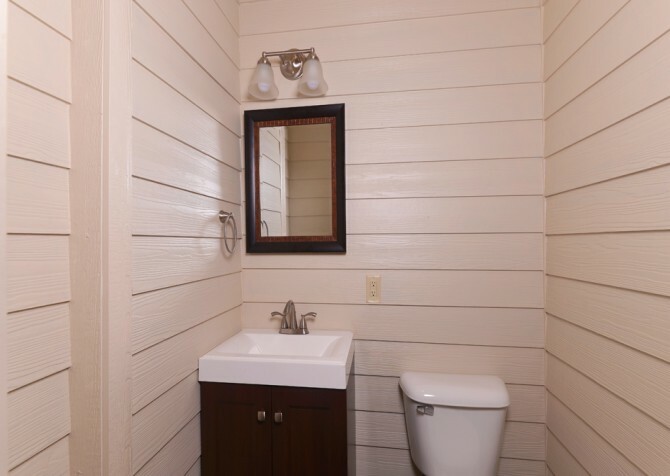 The cabin also has handicap features, making it more easily accessible to many. From no steps into the cabin or pool house and extra-wide doors in a main-floor bedroom and bathroom to a grab bar by the toilet and high toilets for easier wheelchair access, it’s a cabin made to ensure comfort and convenience for your group. 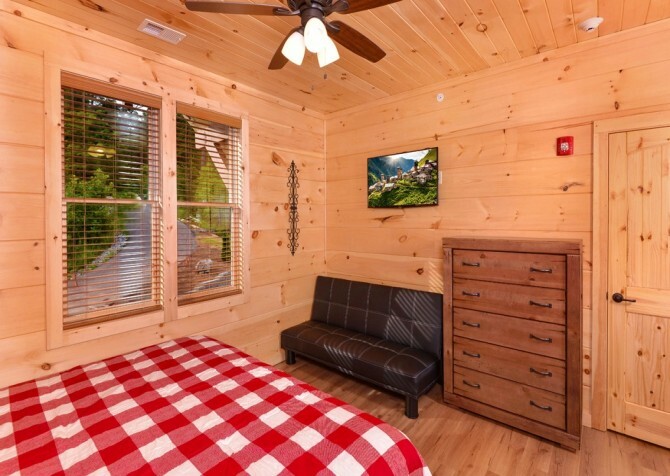 You may not want to leave this gorgeous cabin, but there’s plenty to do in town when you do want to explore. Pigeon Forge is less than 10 miles away, offering dozens of restaurants, attractions for kids and adults, shops, and fun events throughout the year. Pigeon Forge is very group friendly, with attractions like The Island, Dollywood, the Titanic Museum Attraction, and WonderWorks offering something for all ages. 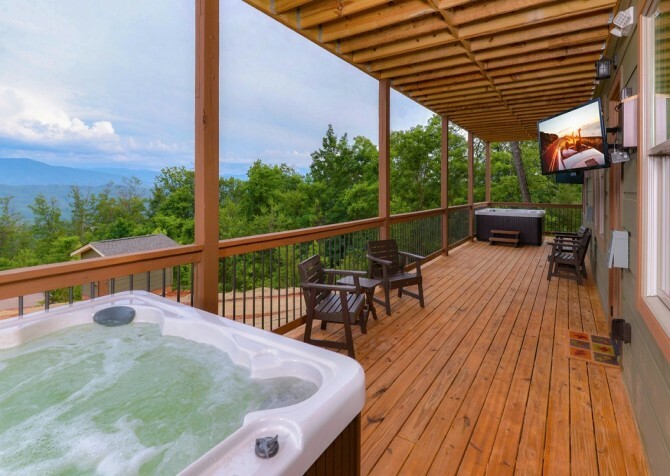 There are also plenty of grown-up go-tos, including moonshine sampling, local wineries (check out the Rocky Top Wine Trail), Scenic Helicopter Tours over the Smokies, and brand-name shops at the Tanger Outlets. A welcome retreat after busy days playing in Pigeon Forge, the beautifully designed living room of Smoky Mountain Manor features 2 plush leather sofas with a matching love seat, a stone-faced electric fireplace (with heat), and a 55-inch LED TV with premium cable channels. 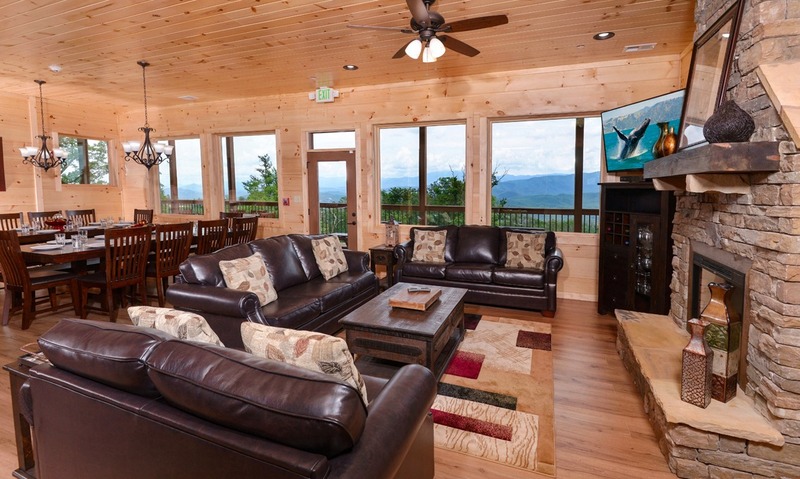 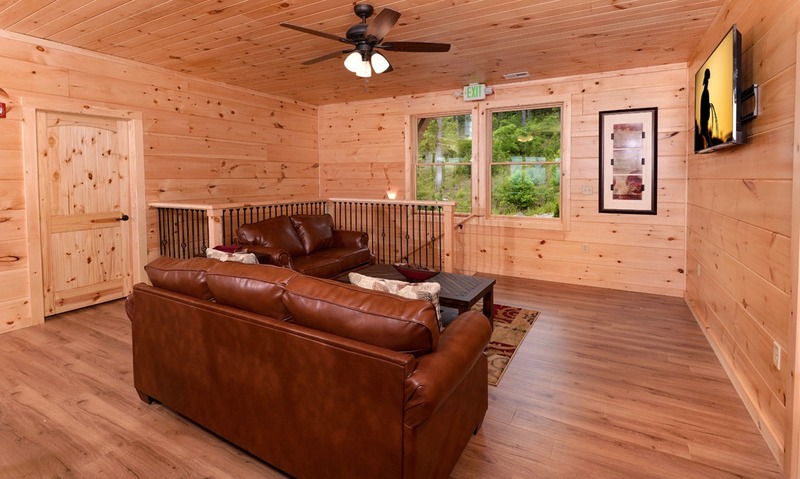 Located on the main floor, it’s a great place to gather and has everything you need for a laid-back afternoon in the cabin or watching a ball game. It’s just off the kitchen, so you can grab a snack or drink without missing anything. 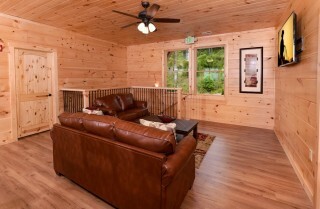 There is also a private seating area just off the living room, with 2 loungers and a side table for more guests. 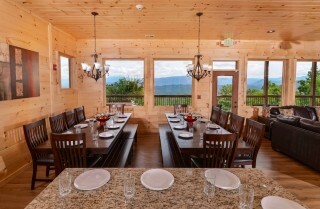 The beautiful, spacious kitchen in Smoky Mountain Manor is well equipped and designed with style and function in mind. Custom tile backsplash, stainless-steel appliances, granite countertops, and dark wood cabinets make you want to spend time in the kitchen! 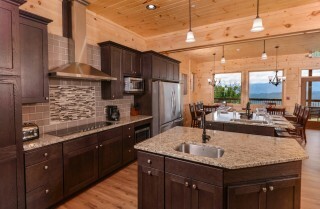 You’ll have ample counter space with 2 islands – one with seating for 6 – along with 2 refrigerators, 2 dishwashers, 2 microwaves, a double oven, and a large, 6-burner Viking commercial cooktop. Plus, it’s well stocked with dishes, glassware, utensils, and pots and pans for in-cabin meals. 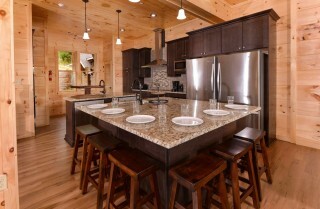 Feeding a group is made easy in this loaded kitchen! 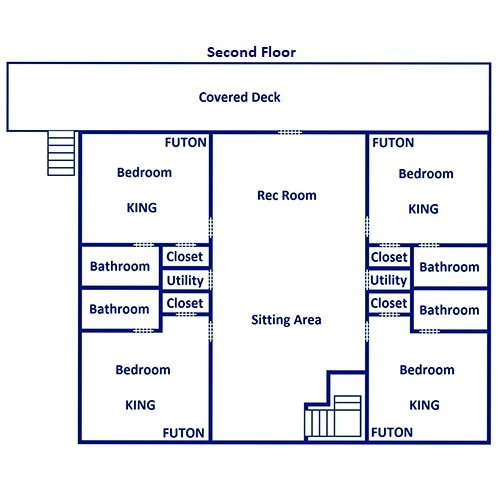 Even if you aren’t cooking, you’ll have plenty of space for everyone’s favorite snacks and drinks or leftovers from downtown. 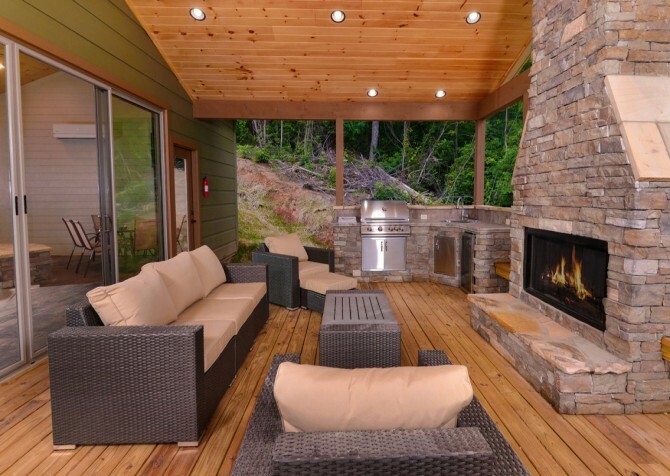 With a large group, you always want to have the kitchen stocked! 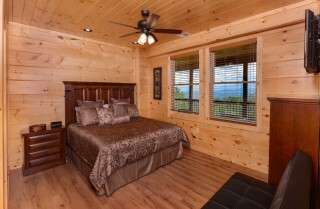 Each bedroom is a retreat within a retreat, with touches of home and space to unwind at the end of a long day. 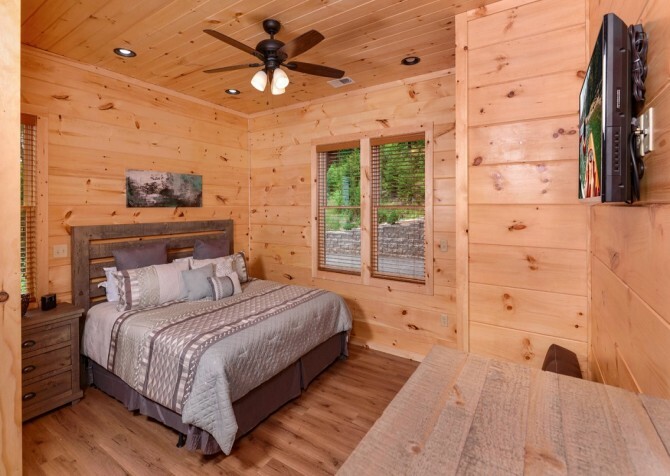 Space for 48 in Smoky Mountain Manor means 10 beautiful bedrooms and 10 full bathrooms (plus 1 half bath in the main house), with 9 king-size beds, 1 built-in full bunk bed, 1 built-in twin bed, and full-size futons in all 9 king bedrooms. 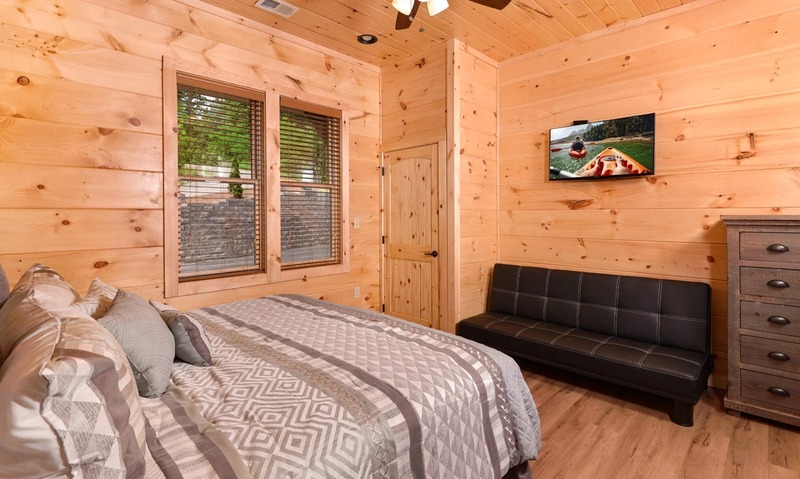 Each bedroom offers dressers and nightstands (and a private bathroom), along with a flatscreen TV for no-fighting-over-the-remote nights. On the main floor, the back bedroom boasts 3-foot-wide door access for both the bedroom and bathroom, along with a high toilet for easy wheelchair access. 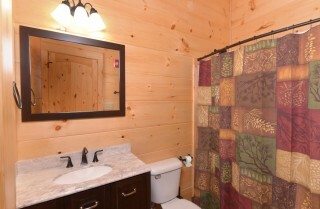 There is also a grab bar by the toilet! 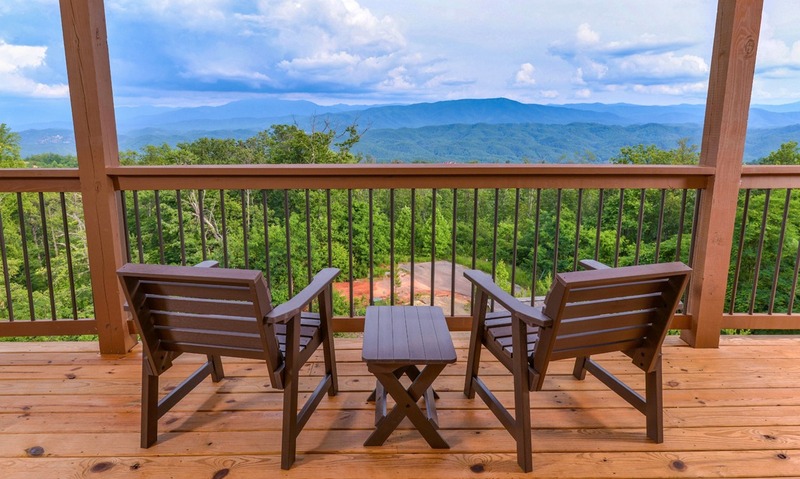 You won’t find mountain views like this at a restaurant downtown. 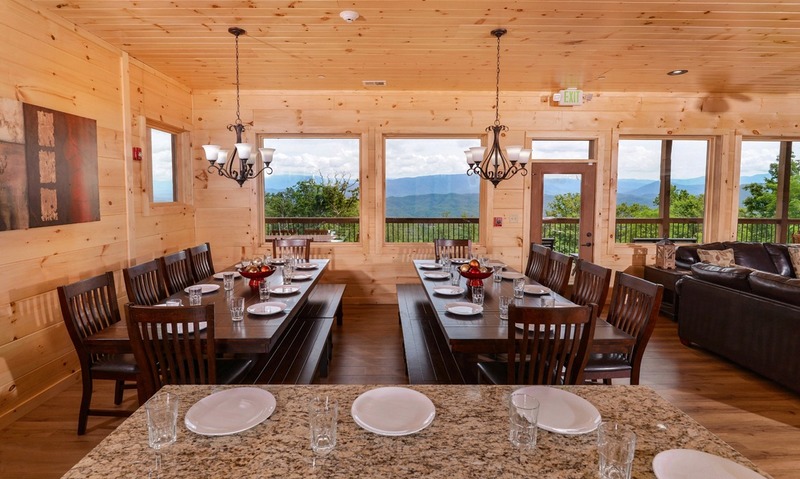 As you sit down at the 2 large dining tables with space for 10 at each, you’ll enjoy stunning views of the Great Smoky Mountains through the windows all along the back wall. The kitchen island by the dining table offers seating for 6 more, and dining tables in the entertainment area and on the decks give you even more space for meals at the cabin. 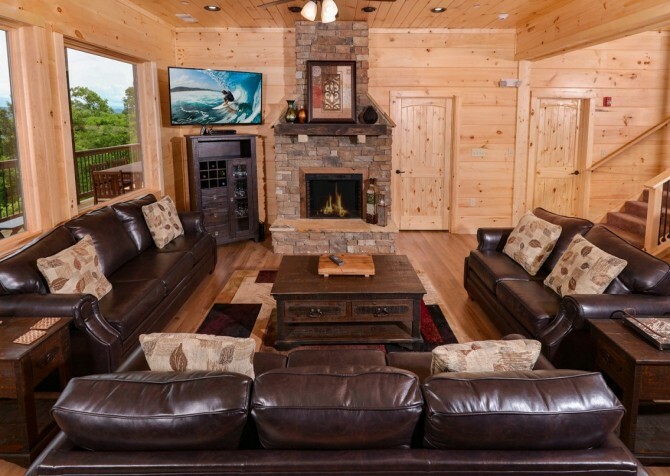 Large, overstuffed sofas stair-stepped for optimal viewing for all guests await in the private theater room of Smoky Mountain Manor. 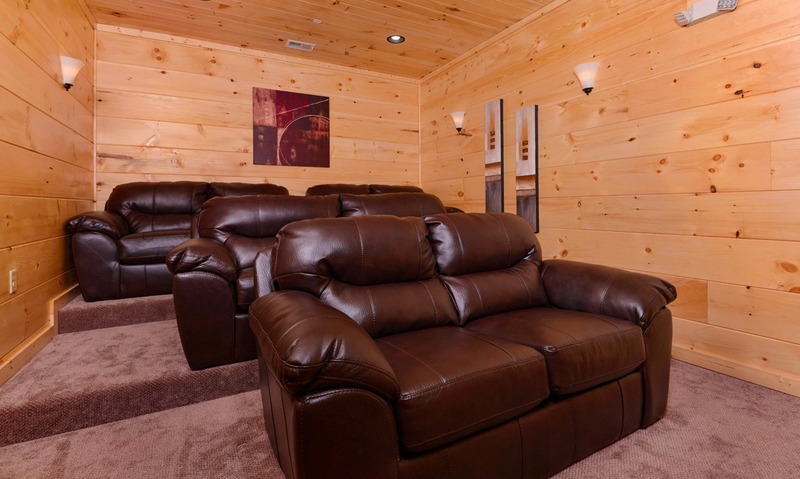 Grab a bag of popcorn and cozy up on a couch, where movie night gets an upgrade with a 70-inch smart TV, Blu-ray player, sound bar, and subwoofer for deep sound experiences. 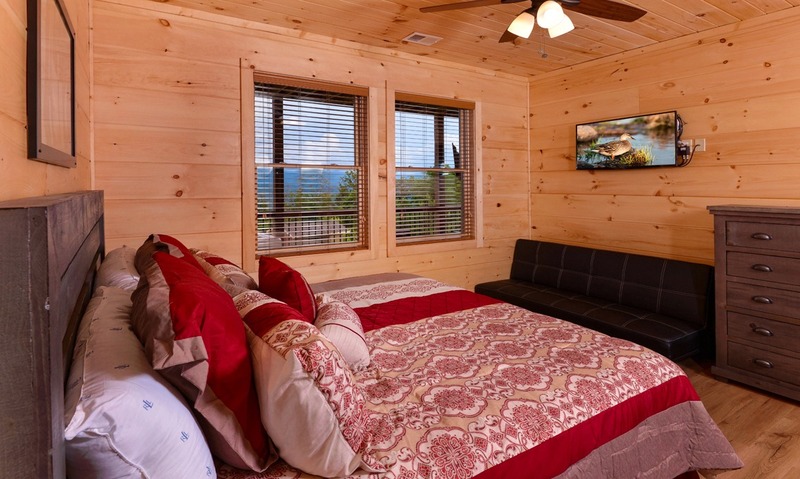 You can stream a cartoon for the kids, turn on the ball game and hunker down to cheer on your favorite team, or enjoy a romantic movie night in the cabin after the kids head to bed. Ready for some fun? Head downstairs to the rec room (next to the theater room) for hours of gaming. Play some Golden Tee Golf, have fun with the 60-game multicade, or challenge someone to a race on the 2 Cart Fury racecar games! 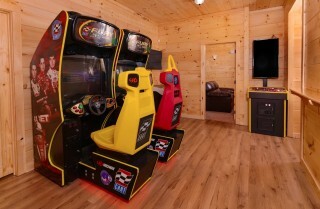 Can’t get enough arcade games? 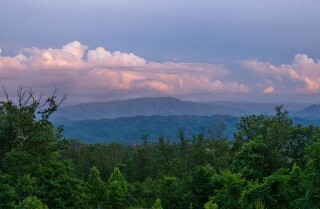 Check out Pigeon Forge, where arcades line the Parkway alongside laser tag, go karts, miniature golf, and more! 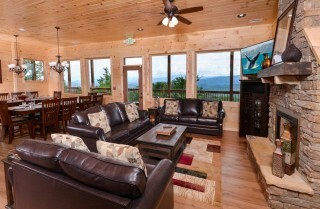 When you’re traveling with such a big group, you need a lot of places to hang out and unwind around the cabin. 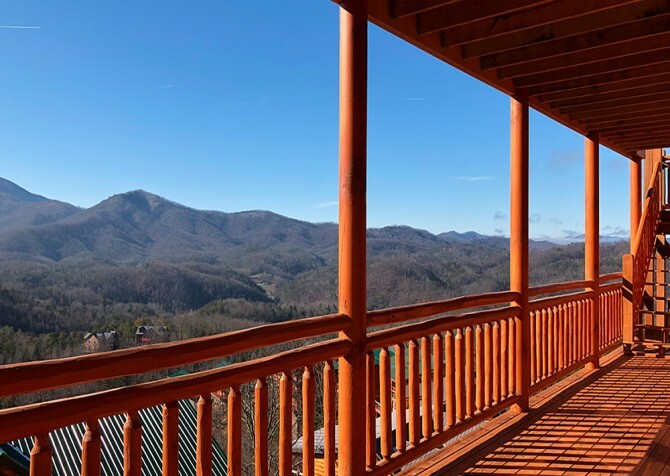 At Smoky Mountain Manor, you’ll have plenty of places inside and out. The entertainment area features a pool table with plenty of space around it to play, along with a 6-person pub table and a lounge area with a comfy sofa, love seat, and 65-inch LED TV with premium cable channels! 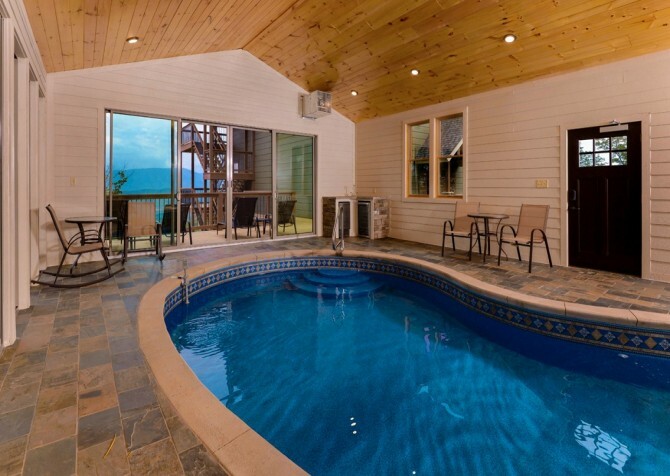 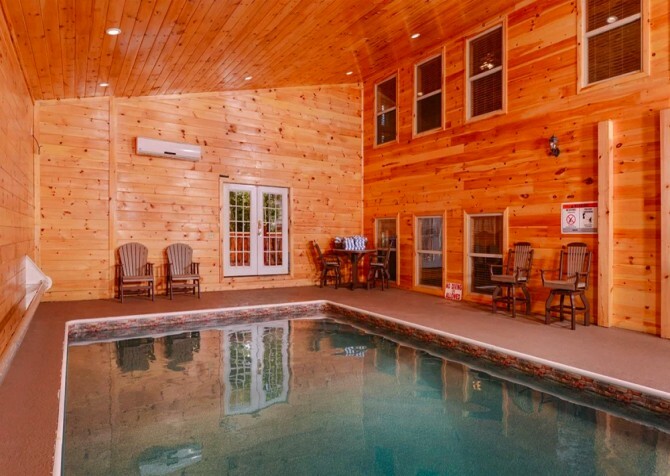 The private pool house might just be your favorite feature of Smoky Mountain Manor, designed in the style of the cabin and offering 3 distinct and beautiful spaces to enjoy: the pool room, the outdoor pavilion, and the sun deck. 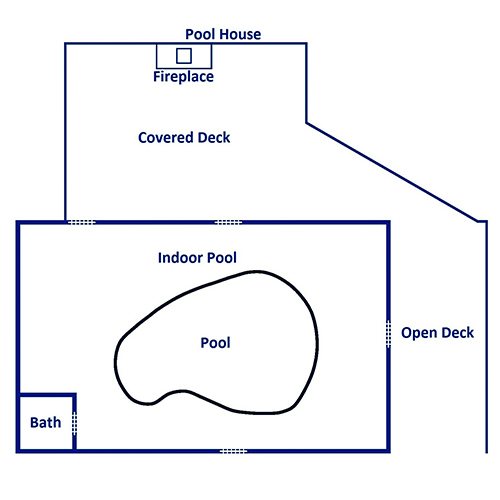 There are also no steps into the pool house, so a wheelchair will have easy access here. 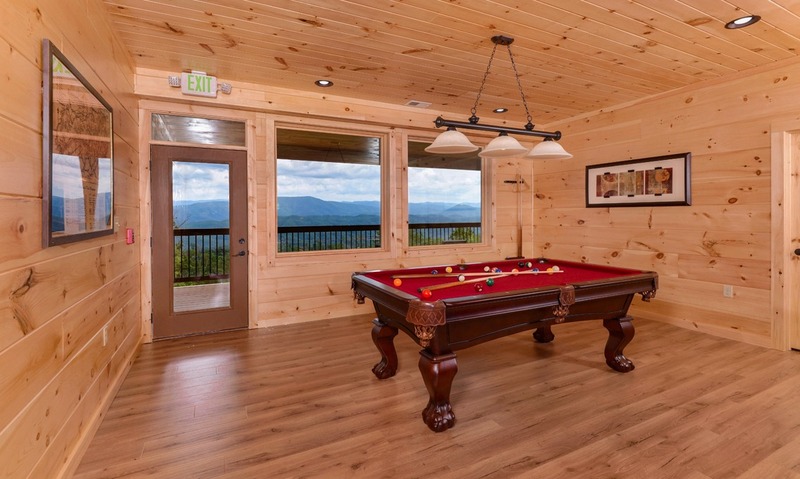 In the pool room, 8-foot-tall open windows and sliding patio doors allow you to move freely between the pavilion and the sun deck. 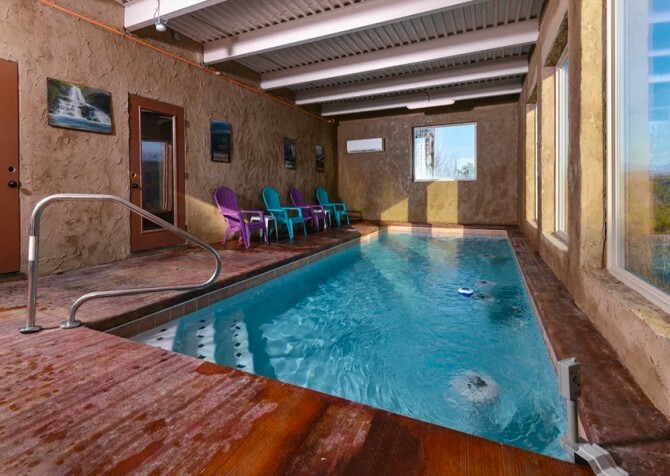 The pool – the showpiece of the room – is a 25-foot-long, 14-foot-wide kidney-shaped pool with a waterfall and custom colored light effects, 3 1/2 - 5 1/2 feet deep, kept at 82 degrees. 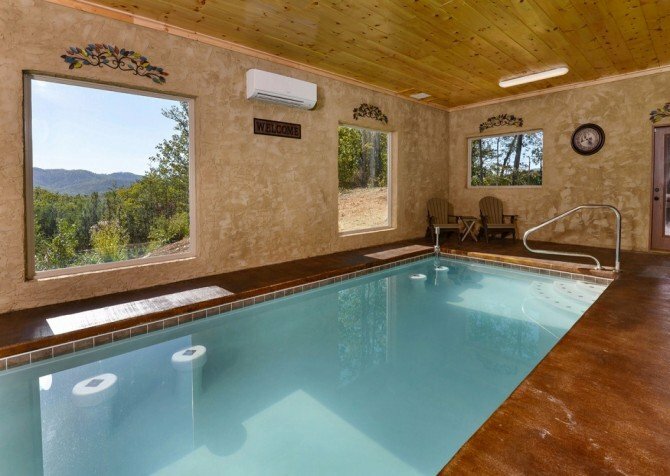 When you’re not swimming, relax in the large, open entertaining space with beautiful views of the mountains. 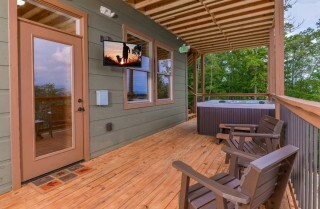 Sit back and relax at the table or make a refreshing drink at the wet bar with a sink, mini fridge, and high-capacity icemaker. 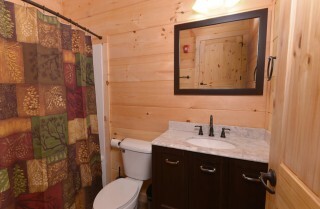 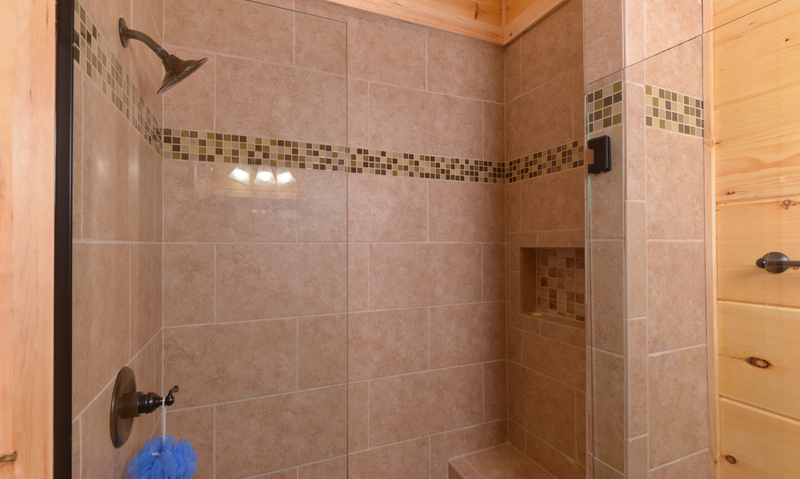 A half bath is also conveniently located here. There are also no steps into the pool house, so a wheelchair will have easy access here. 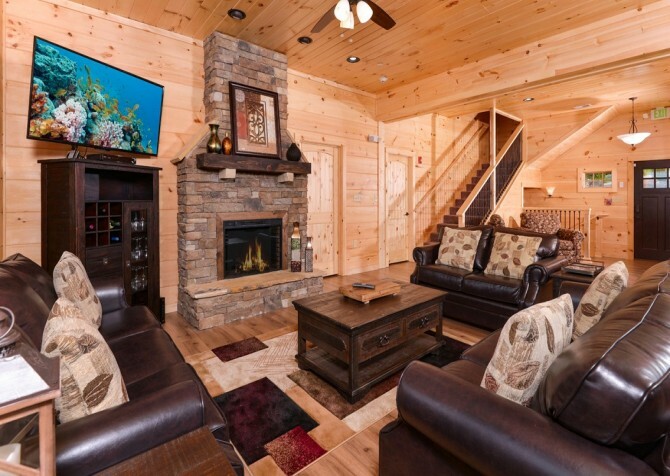 The outdoor pavilion at Smoky Mountain Manor is stunning, with gorgeous wood ceilings, comfortable seating with a sofa and 2 large chairs, an outdoor bar table with 4 stools, and built-in seating on either side of the story-and-a-half wood-burning fireplace. The 500-square-foot space also features an outdoor kitchen with a large gas grill, side burner, mini fridge, and sink, making grilling out a breeze. 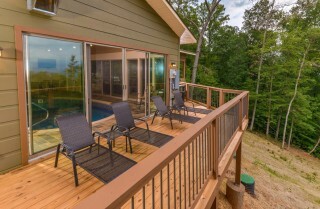 The third pool house space is the sun deck, where you can soak up the rays on beautiful days. Accessible by the large sliding patio doors, it’s great for sunbathing and relaxing while enjoying your awesome Smoky Mountain views. Grab a book and a drink and kick up your feet in the lounge chairs here! 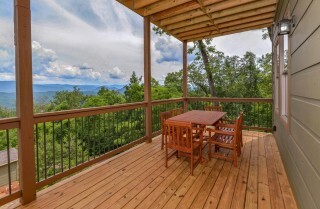 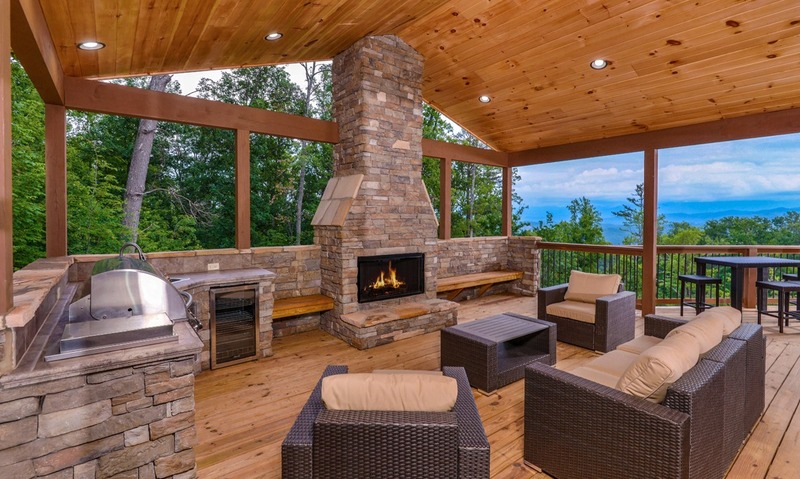 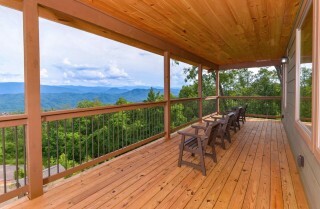 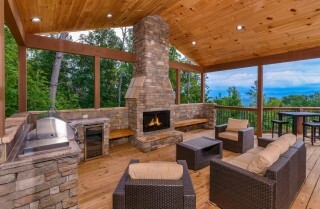 Smoky Mountain Manor offers even more outdoor space, with 3 full decks totaling 1,500 square feet! From here, enjoy views of Mt. LeConte, Clingmans Dome, Mt. Guyot, Mt. 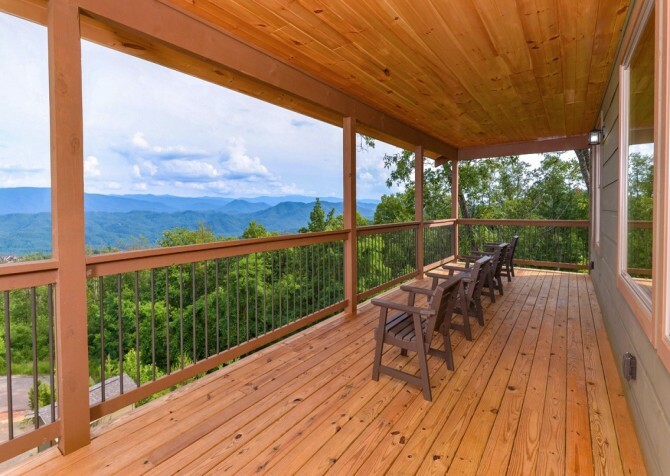 Buckley, and more – and all the way to North Carolina on clear days! 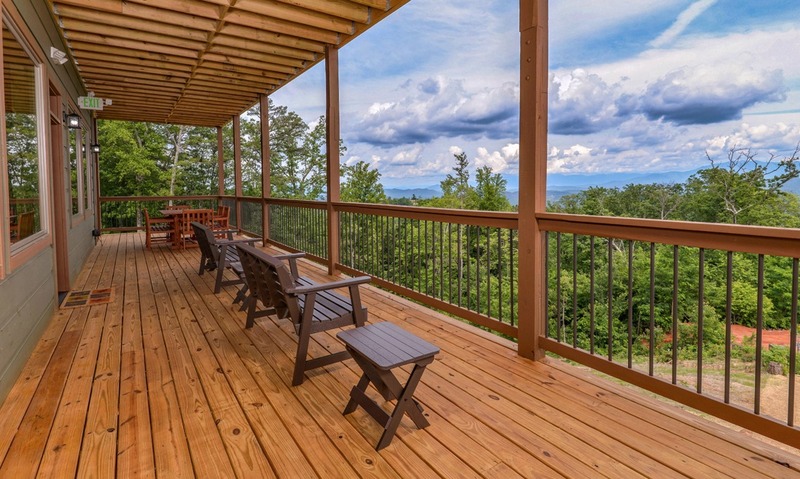 There are lots of deck chairs and tables for the group, and the top floor offers almost 180-degree views of the mountains! 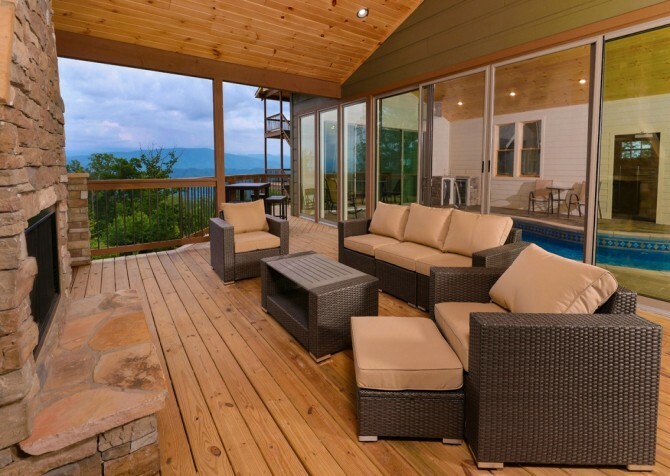 The main deck floor features two 6-person dining tables for outdoor meals, and the cabin has two 6-person outdoor hot tubs with waterfalls, custom lighting, and TVs for relaxing at night! As if Smoky Mountain Manor didn’t offer enough, there are even more amenities at the cabin. 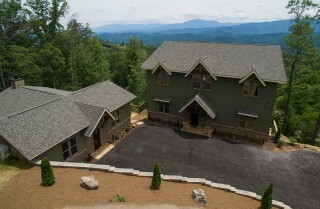 Flat, paved roads lead to the cabin, and the flat, paved driveway makes arrivals and unpacking cars easy. 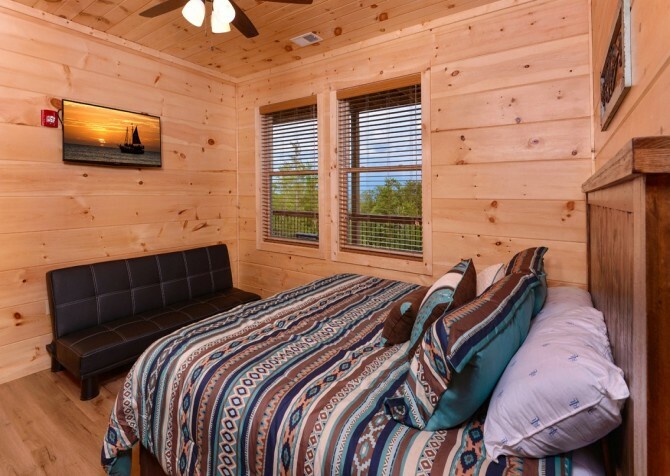 It also has room to park a trailer, no steps up into the cabin or pool house, a washer/dryer, and high-speed wireless internet. 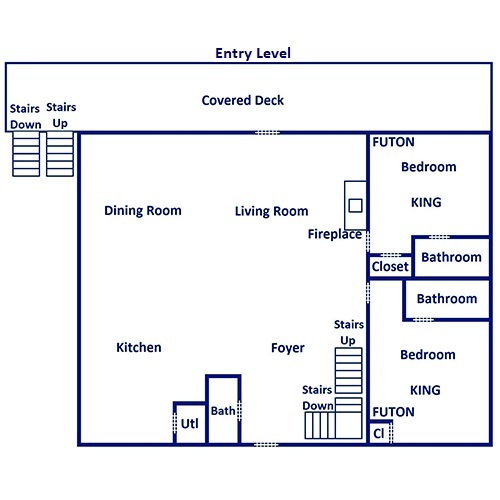 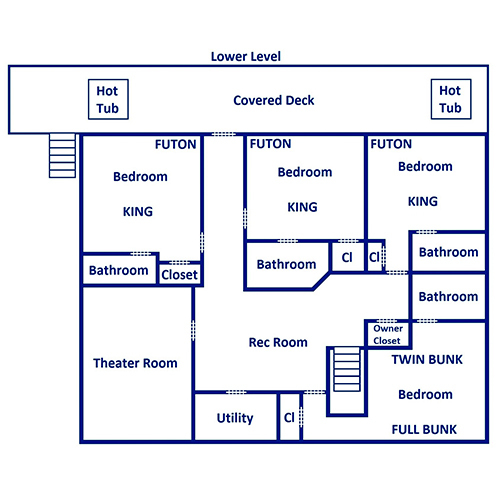 Plus, find extra sleeping space with a queen sleeper sofa in the pool table room on the top floor and 2 queen sleeper sofas in the living room on the main floor. 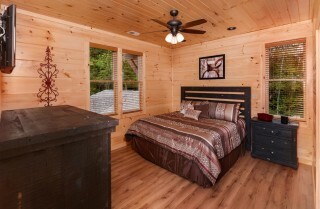 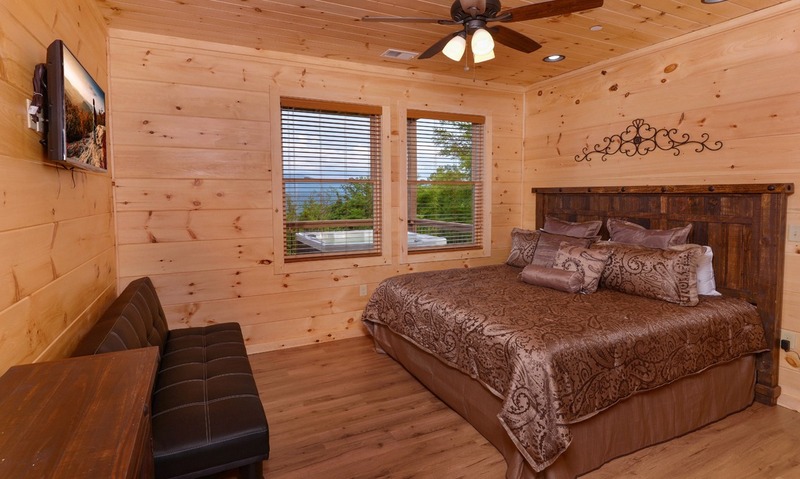 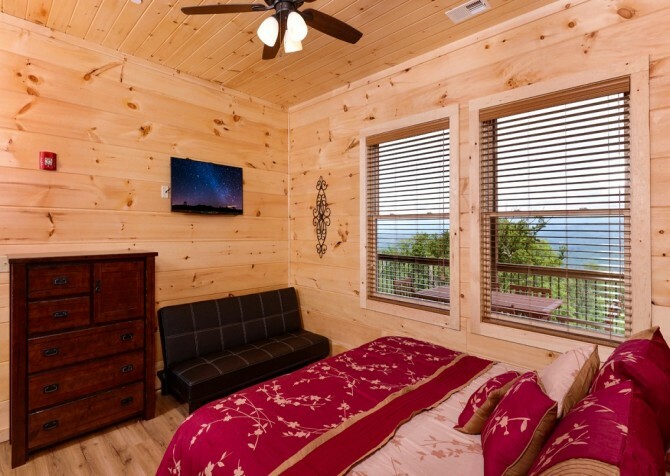 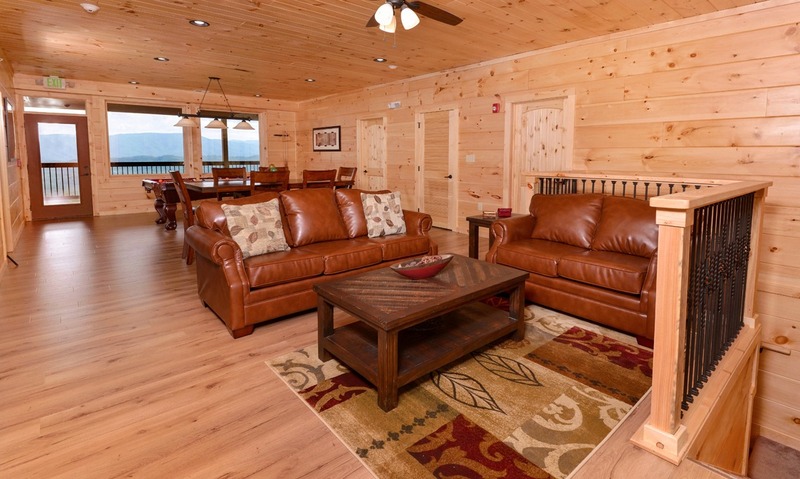 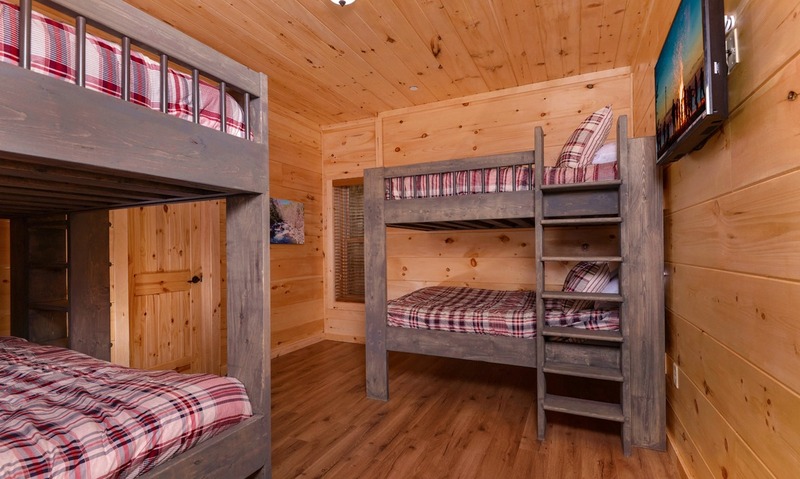 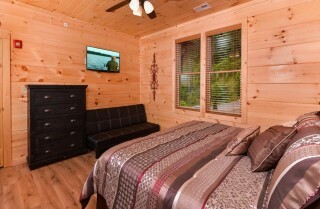 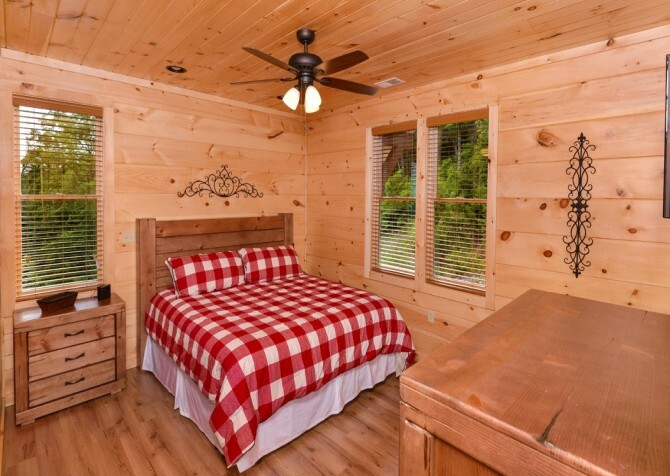 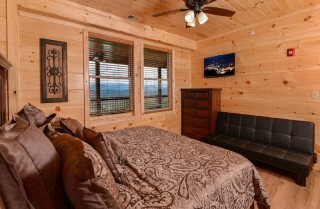 If you can pry yourself away from this awesome cabin, check out all the fun in Pigeon Forge. From mini golf and go karts to group attractions and live music, there is always something to do and see! 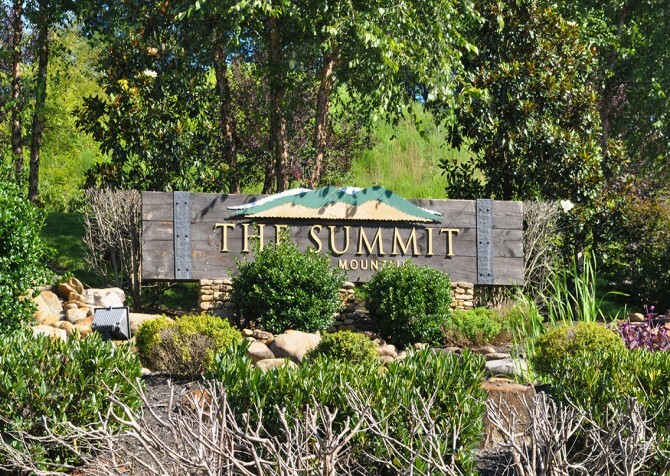 Great for groups, this theme park features roller coasters, kids’ rides, a choo-choo train, musicals and live shows, carnival games and prizes, Southern-style restaurants, shops, Mom-and-baby stations, water features, and more! 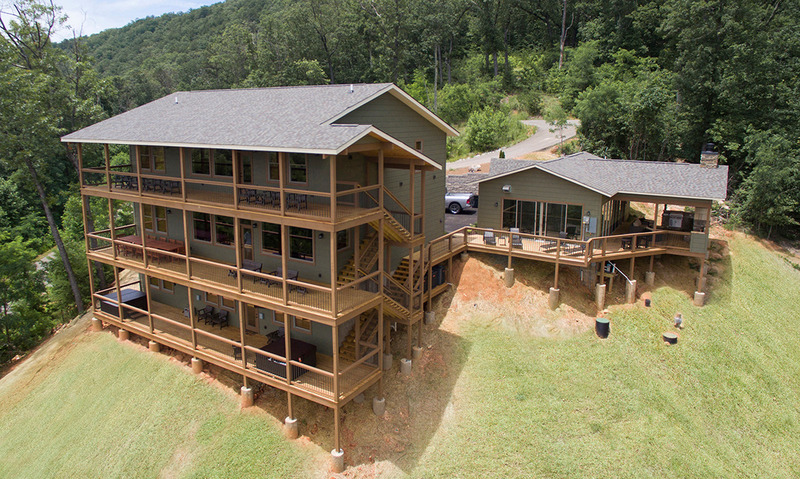 Spend the day exploring The Island with your group, where you can split up and find something for everyone. Ride the Great Smoky Mountain Wheel, watch The Island Show Fountain and listen to live music (and sample moonshine) at Ole Smoky Moonshine, shop boutiques, have a drink at Margaritaville, have a family-style meal at Paula Deen’s Family Kitchen, try a ropes course, break out at The Escape Game…and the list goes on! 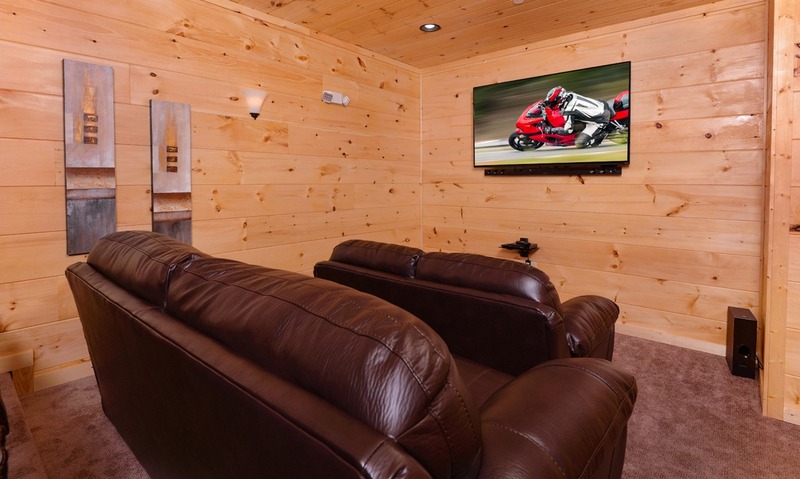 From playing with penguins and walking beneath sharks to getting hands on at Touch-A-Ray Bay and watching dive shows, Ripley’s Aquarium is an underwater adventure the whole group can dive into!